Here we go once again! It seems that whenever certain areas of the country get blasted with a severe winter, i.e. deep snows and frigid temperatures, states that have emergency deer feeding programs begin to debate whether feeding should begin. This, in turn, inevitably brings up the discussion as to whether feeding deer of any kind during the winter is a good thing, a bad and potentially dangerous event, or not even worth worrying about. Take whichever position you wish but I see no real “settled science” if there really is such a thing, save the biological realities that feeding deer the wrong food after a certain time of progressed starvation, may actually end up killing the deer. More on this in a bit. According to the Star Tribune, Minnesota is about to begin putting into play their emergency deer feeding program in some northern areas of the state. There seems to be at least three driving forces behind this decision. 1.) The program requires states to feed when the Winter Severity Index reaches 100. 2.) The deer herd in the areas where feeding is suggested, has diminished in recent years to unacceptable low numbers. 3.) The snows are deep and the temperatures very cold. From information provided at the Star Tribune, Department of Natural Resources (DNR) wildlife section chief Paul Telander, says the DNR doesn’t like feeding deer and opposes the effort. Last week, DNR wildlife section chief Paul Telander said his agency was opposed to deer feeding, noting its steep cost and questionable effectiveness in saving deer from the ravages of extreme cold and deep snow, both of which have plagued northern Minnesota this winter. But let’s get this straight. The “steep cost” is and has been borne by the hunters in Minnesota. An added tax placed on the cost of a license is earmarked for emergency deer feeding…….well, until the government discovered they could designate that money for something else. I may not have sufficient knowledge of the feedback from sportsmen in Minnesota about the added cost but I’ve heard no complaints. According to this article, it seems the sportsmen are eager to see their monetary investment put to work in hopes of saving a few deer. The effectiveness of such a program is a big debate and has many aspects in which to consider. Unfortunately not all aspects may be considered before making decisions about emergency winter deer feeding. I would like to focus on two aspects of the effectiveness of emergency winter deer feeding. First would be the need to implement the emergency feeding program early enough so as not to begin so late it is dangerous for the deer. Lateness can put the deer in further danger of starving but also makes it more difficult for the deer to be able to digest the foods being supplied through emergency feeding. One other state that I have knowledge of that has an emergency deer and elk feeding program is Idaho. I asked George Dovel, editor of the Outdoorsman, for some information about Idaho’s winter supplemental winter deer feeding program which has been funded for several years but politics have played a negative role in effective implementation of the program. It appears as though there may be some marked differences between Idaho’s and Minnesota’s emergency feeding programs. According to the article linked to, Minnesota is beginning the process of ordering deer feed. From a legal standpoint: each of the regional supervisors in the seven IDFG regions are given sole responsibility to determine when to feed or not to feed. However, they are also required to meet certain criteria including having the feed ordered and stockpiled at its final location early enough so as not to be caught in the manufacturing or transportation delays that can occur when local winter storms hit. Because of an Outdoorsman article a year ago, these supervisors are very aware of the IDAPA Rules (which have full force of law). Some states prohibit the feeding of deer, even efforts made by private citizens. Last year, the Maine Department of Inland Fisheries and Wildlife (MDIFW) attempted to get passed a law prohibiting the feeding of deer. There was quite an outcry from the citizenry and the proposal was canned; I think mostly because the MDIFW couldn’t really come up with any real sound reasons to stop people from feeding deer. One issue was pubic safety, in particular the issue of deer crossing highways to reach feeding areas. We hope those issues have been addressed sufficiently. Another was the problem of people deciding to feed late in the season. An ongoing education program, as well as the development of better foods available, has limited that threat to the deer. Although white-tailed deer can sometimes survive where mule deer would perish, early IDFG Bienniel Reports show photos of whitetails being provided food by local citizens sawing off evergreen boughs (branches) when the deer could not reach them due to snow conditions. It is important to remember that saving nucleus small bunches of deer that are healthy enough to reproduce – not saving every deer in the forest – is the most important key to replacing abnormally heavy winter losses. As always, the key is starting soon enough to save small bunches of breeding stock rather than a costly massive feeding program begun too late. It costs far more money to try to feed 1,000 deer too late with most of them starving – than to feed 100 deer properly soon enough to produce healthy offspring. It sounds as if Minnesota is experiencing similar problems with a shrinking deer herd as the State of Maine is. What needs to be understood is that when a region has a dwindling deer herd and plenty of large predators, i.e. in these cases wolves/wolf hybrids, coyotes, bears, bobcats, lynx, one or two severe winters can destroy deer herds to levels that are non sustainable. In years with severe winters, Dovel points out that for purposes of being able to sustain and more quickly rebuilt a deer herd, supplemental feeding in those targeted areas are helpful. Deer feeding also can cause deer to congregate, and could contribute to both the spread of disease and an increased likelihood the animals will be killed by wolves. It shows the lack of knowledge and understanding of deer behavior and the purpose of supplemental, emergency winter deer feeding programs; at least those programs that are designed correctly. 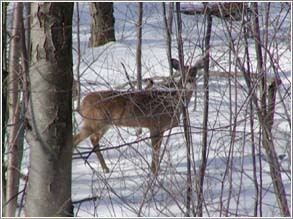 When deer winter in deer yards or deer wintering areas, they are already congregated. Some deer travel 50 miles or more to reach deer wintering areas. I don’t think deer from outside targeted deer wintering areas will come and join already yarded-up deer. Deer do not have the fat reserves and energy to make such a trip. And, if the deer were that close and in that high a number, perhaps it wouldn’t be necessary to be feeding the deer. As far as predators go, that point becomes moot. As I said, the deer are already in their wintering areas and the wolves know exactly where they are. One can argue that a healthier, better fed deer would stand a better chance of escaping the jaws of death from wolves. Supplemental winter feeding of deer is not for every state nor is it for an entire state. But under the right conditions, just like targeted predator control programs, targeted emergency supplemental deer feeding programs could be effective enough to save a deer herd. The cost is being borne by the sportsmen and so long as they are coughing up the dough, they are saying they believe it is worth the effort. There is one other aspect of winter feeding of deer by citizens (not the emergency winter deer feeding programs run by fish and game departments) that deserves mentioning. Provided the people are setting up a safe feeding site, begin the feeding program early and keep it going until spring green-up, let them do it. It gets, not only the people feeding, but those coming to view these magnificent creatures, a real sense of ownership and pride. They then feel they are a part of the deer management program and that will go a very long way in garnering support for other wildlife management programs. What more could a wildlife manger ask for?